The Alton Road-Dade Boulevard construction maze gets a new little twist today, and today only: FPL will be working on traffic signals at Dade and Meridian, a key pressure point in the detour around the Alton Road work. Traffic lights will be out from 9 a.m. til 1 p.m., and police will be directing traffic at the intersection. Good thing this is a holiday week. Bike path and seawall work between Alton Road and Michigan. Stalled work on the Collins Canal seawall and bike path has resumed, and the project should be complete in late April, Belle Isle residents were told this week. Construction on the seawall and bike path was halted last fall after Miami-Dade prosecutors arrested former Miami Beach procurement director Gus Lopez on 63 charges including racketeering, bid-tampering and illegal compensation in connection with a dozen different city contracts. The bike path contract, with Harbour Construction, is one of the projects tied to that investigation. The city has decided to move forward with the work, said Rick Saltrick, chief capital projects engineer for the city. “We stopped work for a while because of procurement issues,” he told a gathering of the Belle Isle Residents Association on Wednesday night. ” We decided to go ahead and let him finish….We shouldn’t punish the rest of the city” with an unfinished project. Harbour Construction had already been been paid more than $3.6 million on the $4 million project. The Miami Herald reported that police said company employees admitted to falsifying a letter of credit and receiving leaked information about other companies’ bids. The project extends the existing bike path from where Dade Boulevard splits off of 17th Street at the Collins Canal bridge to Convention Center Drive. In all, it’s 2,900 long, and will enable bikers, runners and parents pushing strollers to get from Belle Isle to the beach on a nice sidewalk all the way. The improvements include raising the existing seawall to address times of high water. Completed, the path will feature a wider concrete path, landscaping and improved lighting using LED fixtures. A reminder: Construction of the bikeway and running path along the Collins Canal on Dade Boulevard will make running and riding safer from Belle Isle all the way to the beach. Think about that as you navigate around the short-term inconvenience of road closures and lane shifts on Dade Boulevard. The activity today involves shifting eastbound and westbound lanes on Dade between Michigan and Meridian avenues to the north, leaving one lane in each direction. This is the area between the Dade Boulevard Publix (the old Publix) and Miami Beach High School. 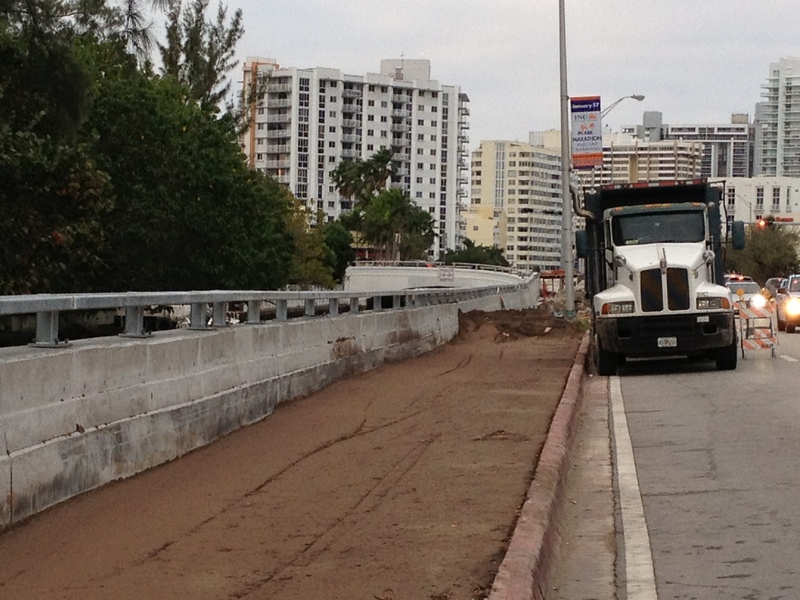 Crews will be working on the Collins Avenue seawall. The regular traffic pattern should be restored on Friday. Eastbound detours at the 17th Street/Dade Boulevard bridge (Between the split and Alton Road) continue. Dade Boulevard will be closed eastbound from the bridge at the split with 17th Street Bridge to Alton Road starting early Friday morning, and traffic will be detoured through 17th Street. It’s part of the continuing construction of the Collins Canal bikeway, and will continue for much of the next week. Are Belle Isle and the Venetian Islands the epicenter of road construction? If you drew a line from west edge of the Venetian Causeway and followed it to the Atlantic at 21st Street, you’d see earth movers and paving equipment all along the path. Of course, if you live in neighborhoods north of Dade Boulevard and Miami Beach Golf Course, you’d get to enjoy a sewer line project, too. — Dade Boulevard will be closed eastbound from Michigan to Meridian avenues for work on the Collins Canal pedestrian-bike path. Westbound Dade Boulevard will be open to all traffic. This will remain the case through mid-April, according to the city of Miami Beach. — On the Venetian Causeway, the installation of pink concrete crosswalks is nearly done, and repaving the road is moving ahead on Rivo Alto, DiLido, San Marino and San Marco islands. At varying times, only one lane will be open, and flagmen will be directly traffic. Expect slowdowns and tire crunching bumps on the route. — Miami-Dade County public works, which is overseeing the Venetian Causeway work, is winding down this phase of the work — with the finish in sight. Expect smooth sailing in about a month — hopefully before the rainy season. Then we’ll see how the new drains work. And if that isn’t enough: There is a public hearing on Tuesday, March 27 on the proposed West Avenue Bridge. It happens at the Miami Beach Regional Library, 227 22nd St. (and don’t try to get there by going east on Dade Boulevard). The meeting room opens at 6 p.m. and the presentation starts at 6:30 p.m. There is parking behind the library. Eastbound lanes on Dade Boulevard will be closed again Tuesday east of Bay Road on Miami Beach so construction can resume on the new bike/pedestrian path along the Collins Canal. The roadway was closed to eastbound traffic between Bay and Alton roads for much of January and early February, but the city reopened the stretch to accommodate boat show traffic. For drivers, the workaround is to bear right on 17th Street and then turn left on Alton Road.